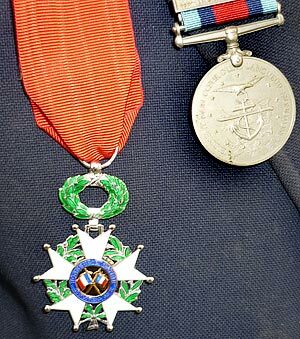 In conjunction with events in 2014 to mark the 70th anniversary of the Normandy landings, the government of France advised the Ministry of Defence that it wished to award the Legion d’Honneur to all surviving veterans, and invited applications. 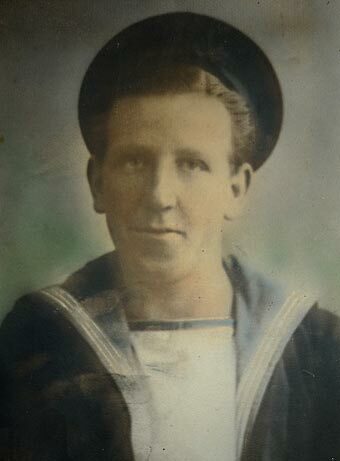 Theydon Bois resident William Joyce was one of some 2800 applicants for this award. 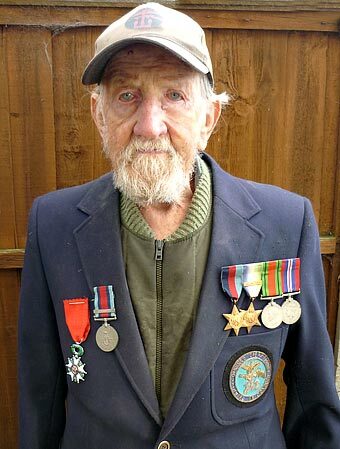 He actually landed himself on Sword beach on 6th June 1944 as a wireman on board a LCT (Landing Craft Tank) as part of the Combined Operations 41st Flotilla. We are pleased to announce that William actually received his medal from the French Government recently, and so has been appointed to the rank of Chevalier in the Ordre national de la Legion d’honneur. 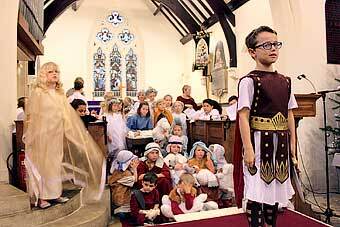 Over 40 children from Mary's church took part in the Nativity service on Sunday 14th December. Prophesy readers, narrators, actors and singers performed excellently to a packed church. 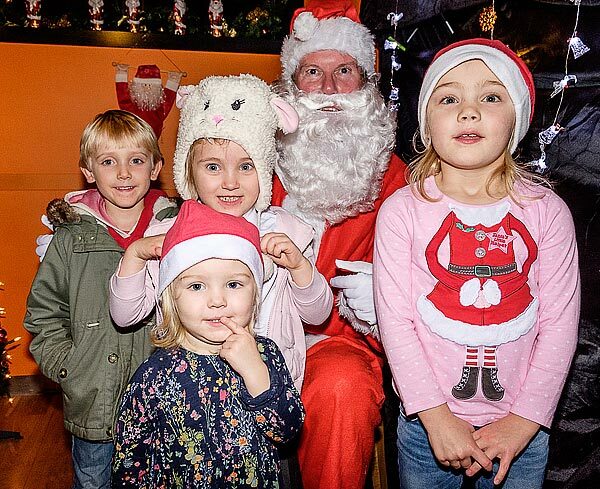 This years Primary School Christmas Fair held on 12th December was again a great success raising a profit of £3500. Head Mistress Mrs Lewis thanked the school PTA for all their efforts. 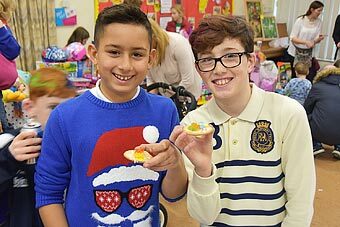 Some more photos of the event can be found on the School PTA page here. 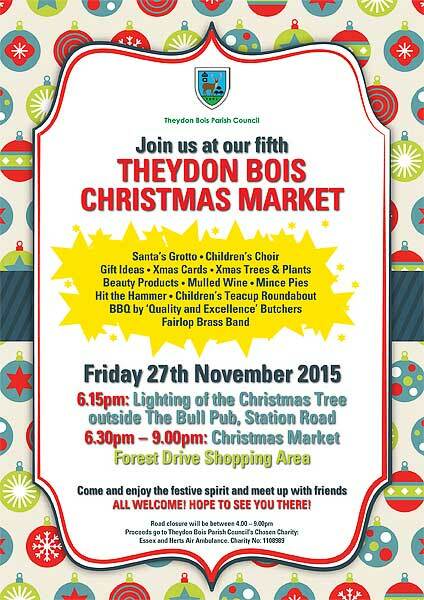 This years big pre Christmas event for Theydon Bois was again the Christmas Tree Lighting Ceremony and the 5th Christmas Market held on 27th November. 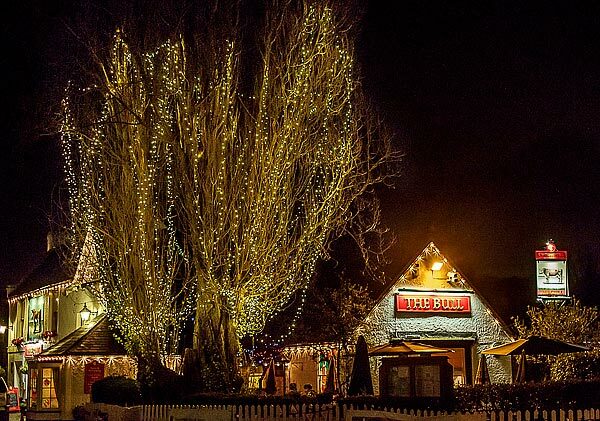 The Parish Council decided, with the permission of the publicans, to add the Christmas lights to the large yew tree in the garden of The Bull as this was just near where the Christmas Market began in Forest Drive and therefore visible throughout the market, as well as from across the village. 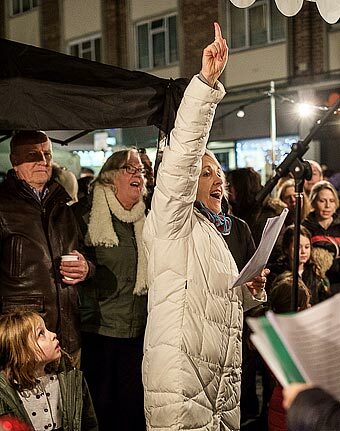 The lighting of the tree was this year performed with a count down from Maureen Day the widow of Bob Day who was the recipient of the 2015 Parish Council's Lifetime Achievement Award (formerly Villager of the Year Award). Bob unfortunately died earlier this year. There was a big turnout of villagers and visitors for this market that gives our village traders an opportunity to promote their businesses and also means shoppers can purchase some of their Christmas gifts locally. The Market had all the usual attractions with the choir from the Primary school singing a selection of Christmas songs, Fairlop Brass Band playing festive tunes, rides for the children, many stalls with food or gifts and of course Santa's Grotto that again had long lines of children waiting outside Belgique to meeting Santa. The predicted rain held off until about 8.00pm when a sudden downpour and strong winds unfortunately discouraged many people from staying longer. Thanks is again due to Parish Councillor George Howard who oversaw the event and did much of the work to make it happen this year, but it was the efforts of stall holders, shopkeepers and volunteers that made it another successful evening despite the rain. The event and the following Saturday street collection raised a total of £629.51 for Essex and Herts. Air Ambulance. Thank you to all those who donated and turned out to support the event and make it such a happy occasion. 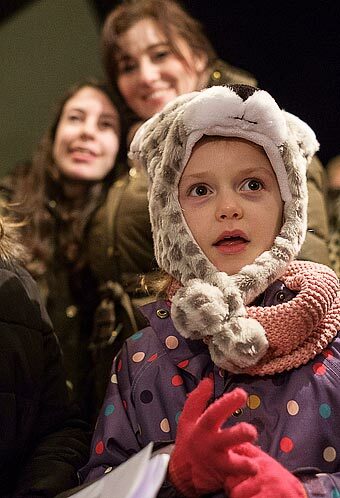 There is a full set of Photos of the Tree Lighting and Market here. 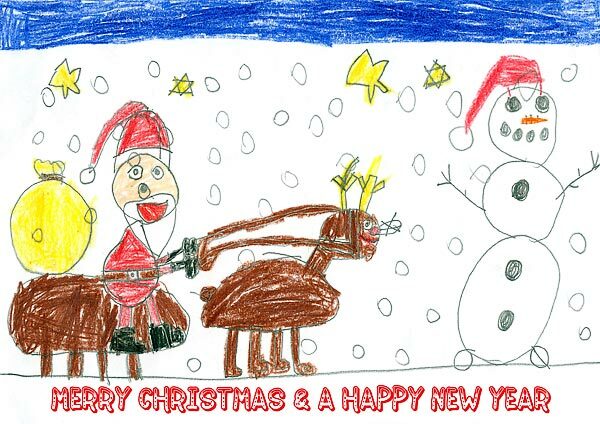 The overall winner in this years Christmas Card Competition for the pupils of Theydon Bois Primary School run by the Parish Council in conjunction with Theydon Newsdesk was Daisy Polain of 'Pakes' class and her entry is the Parish Council's card for 2015. 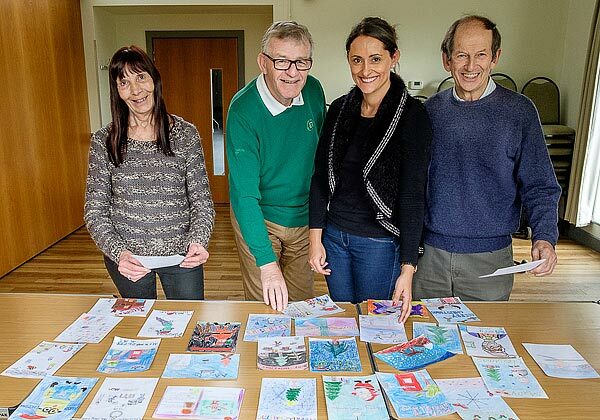 The standard seems to get better and better each year with some wonderful entries from the children, so this year there was more arguments than usual among the judges before the winners were finally decided. For the first time the overall winner, Daisy Polain, came from the Infants/Reception group of classes. There is both an Infants/Reception Winner and a Junior Winner who receive a prize donated by the Parish Council. Anthony Girling of 'Buxton' class was this Junior winner. All the class winners can be seen in our Gallery of Cards with Winners Names here. Residents are being invited to take part in a review of the new domestic waste and recycling contract let by Epping Forest District Council. Residents have the opportunity to ask questions directly to councillors, council staff, consultants and Biffa managers involved in the implementation of the new waste contract at a meeting of the Neighbourhoods and Communities Select Committee on 17 December at 7pm at the Civic Offices in Epping. If you wish to submit a question this can be done by emailing: democraticservices@eppingforestdc.gov.uk by 5pm on Friday 11th December. This is a great opportunity for residents to get involved in review discussions. More information here. 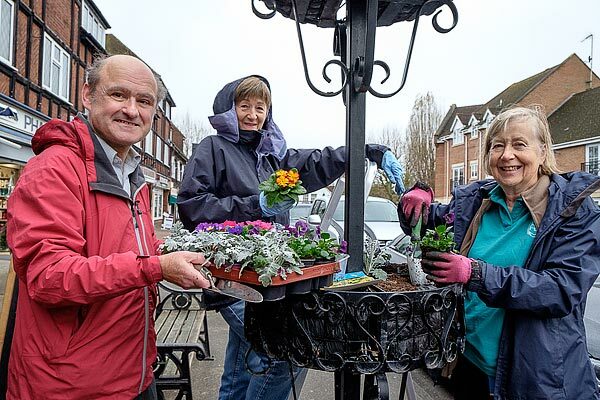 Horticultural Society members have added displays to the winter planters in Forest Drive. These installed to coincide with the this Fridays Christmas Market to add colour to the festive scene. Additional bulbs were also added to carry flowering through to next spring. Pictured above are society committee member Hugh Meteyard, Secretary, Lee Anderson and Chairman Liz McGuire. 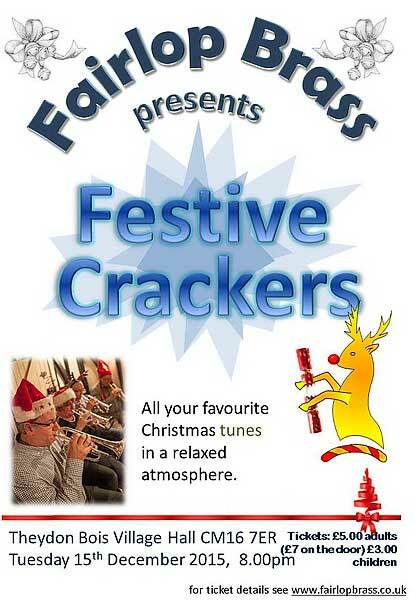 Following a highly successful inaugural “Christmas Crackers” concert last year, Fairlop Brass returns to the Theydon Bois Village Hall on Tuesday 15th December at 8pm with “Festive Crackers”. 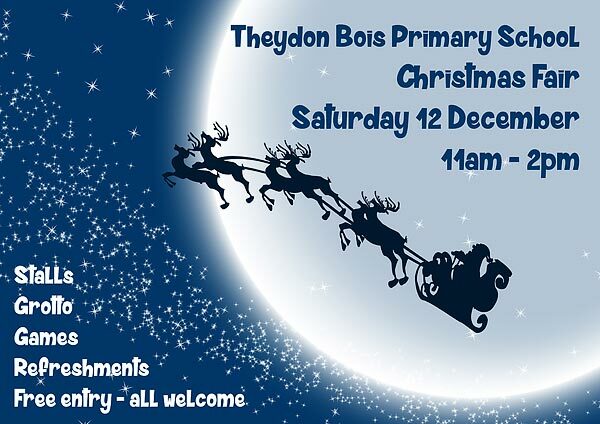 The 30 strong Brass Band, which includes among its members our primary school headmistress, Lesley Lewis, will present a concert of Christmas favourites for all the family which will include, Have yourself a Merry Little Christmas, Let it go (from Frozen) Jingle Bells, Rudolph the Red Nosed Reindeer as well as classic Christmas pop hits from Slade and Wizard!!. This will be a night for the whole family, who are invited to bring along their own drinks and nibbles, and singalong with the Band as they play well known Christmas Carols. Tickets are priced £5 for Adults if ordered in advance (£7 on the door) and £3 for Children, and are available by e-mailing mailus@fairlopbrass.co.uk. The Band are starting to become regular performers in and around Theydon Bois, and were pleased in September to support the Theydon Golf Clubs Captains’ Charity day, and help raise some £2,000 for good causes. See their website www.fairlopbrass.co.uk for more information about the band. EFDC at an Extraordinary Meeting of the Full Council last night finally refused the second planning application for the Sixteen String Jack Site EPF/1629/15. This application had originally been refused at the earlier local area planning committee (Plans East) in October by a considerable majority. A minority of councillors then referred this decision up to the District Development Management Committee (DDMC) meeting on the 4th November where the earlier refusal was overturned, but only with a casting vote by the Committee Chairman. Again a minority of councillors then 'stood up' to refer the final decision to a full council meeting. Attempts were made to get further consideration of this of this second application deferred until the imminent appeal decision by the Planning Inspector on the previously refused and similar first application was known, but these were refused by EFDC. Councillors also decided not to defer at last nights meeting. After a debate that lasted well over an hour the councillors voted to refuse the application by 20 to 15 with 2 abstentions and this result was greeted with a round of applause by the many villagers who opposed this application and attended to listen to the debate from the gallery. As this decision was based on the same reasons for refusal as the first application it is probable that all parties will now await the result of the appeal of that first application appeal before deciding to proceed further. If the appeal is dismissed the developer still has the option of appealing this second application or submitting a further modified new application. EFDC Webcast of the 23rd November Meeting here. Some older people have received telephone calls from a caller who purports to be from the GP surgery and is asking for an appointment to discuss the persons mobility needs. During the appointment, the older person is persuaded to buy mobility aids which are either unnecessary or inappropriate and always expensive. St. Mary's Church has been supporting the work of the OCC for a number of years by sending shoeboxes filled with simple toys plus basic toiletry and stationery items to children living in poverty in various parts of the world, using money raised by the Mission Committee and donations from members of the Church and other villagers. 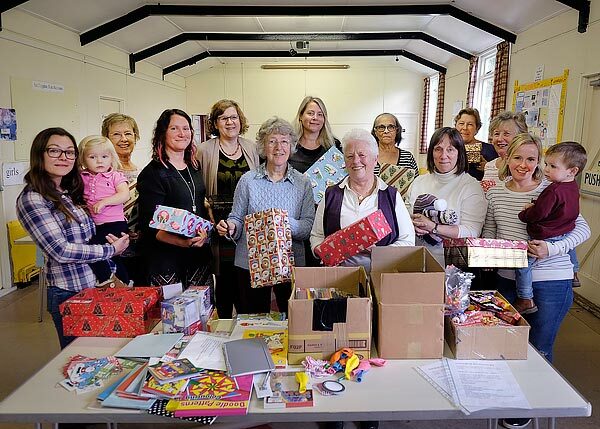 We have a mass wrapping and packing day in early October, when the basics and any suitable donated items are packed by a band of enthusiastic villagers. The Mission Committee held 3 Soup Lunches in November and the money raised is divided between 3 charities, one of which is the OCC. This money helps to pay for any missing items and to go towards covering the transportation cost of £3 per box. We've evolved this system over the years and although it might not be the conventional way of filling the shoeboxes, it works for us and we've managed to send over 200 boxes every year for quite a few years. 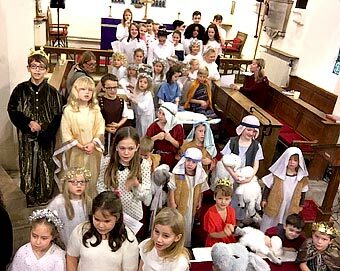 It's also a lovely way to get other people involved, including our Mother's Union group, Junior Church, the local junior school and lots of other people in the Village, especially keen knitters who provide masses of hats and mittens for the boxes. We've just taken 203 boxes to the warehouse in Harlow, so... a big "thank you" to everyone who helped in any way, to put big smiles on the faces of 203 of the worlds' poorest children this coming Christmas and please join us when we do it all again next year. Our County Councillor John Whitehouse has been raising concerns about the county council’s use of 0845 numbers for general enquiries including reports of highways problems for some time. Most call packages don’t include 0845 numbers in their “free minutes” quota. It seemed unfair that residents had to pay over the odds to report a pothole.In fact use of 0845 numbers has cost Essex residents around £500,000 in extra call charges, according to a freedom of information request last year. Many issues can also be reported by email or on the county council’s website at www.essex.gov.uk. 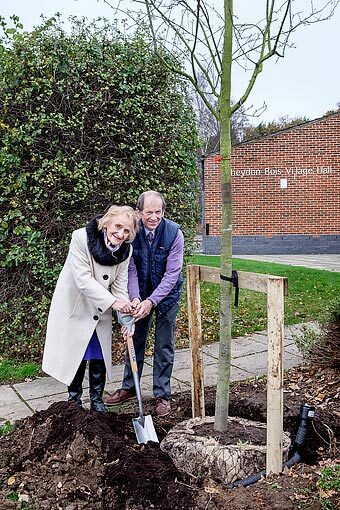 The Village Association has planted a tree at the entrance to our village hall in memory of Bob Day, who had been a long standing member of the Association and for many years its Treasurer. Bob had made many other contributions to our village community including being one of our first Tree Wardens and President of the Rural Preservation Society. 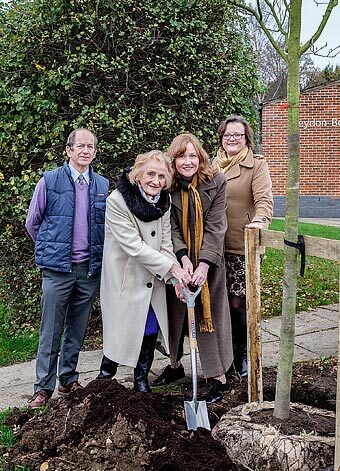 The formal planting of the Bob Day tree took place on 20th November and was completed by his widow, Maureen and daughters Nicola and Alison together assisted by VA Chairman Martin Oliver. 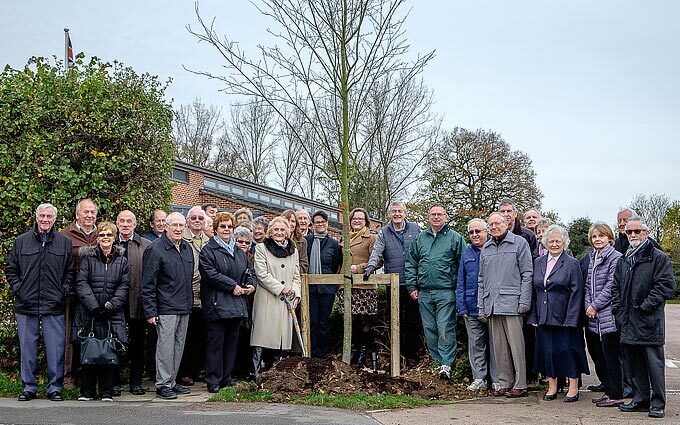 Other members of the family, together with representatives from the Village Association and the Rural Preservation Society also attended the planting and the reception in the Village Hall that followed. Bob had lived in the village for all of his life and contributed a series of articles on his early life for Village News from September 2013 - March 2015. These issues are still available from our Newsletters Page. Being a rocket scientist is a fairly unique profession. Loughton Astronomical Society is the home of astronomy in West Essex. We meet on Thursday evenings between 8:00 and 10:00 p.m Visitors are always welcome; no need to call first, just turn up. 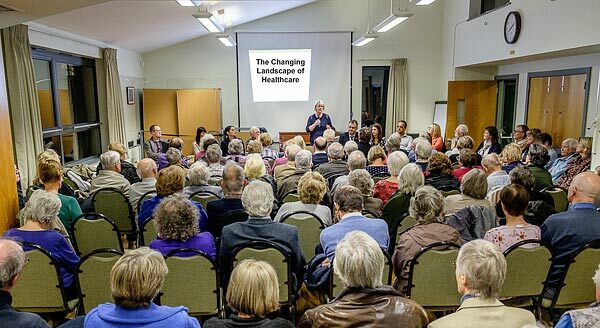 Villagers packed the combined Poplar/Beech rooms at the Village Hall to capacity last night for a presentation by the Limes Medical Centre on "The Changing Landscape of Healthcare" followed by a question and answer session on the issues our villagers were experiencing in obtaining appropriate local healthcare. The presentation was made by Debbie Bodhanya, Limes Managing Partner and Dr Tareq Abouharb assisted by other Limes GP's including Drs. Susan Hangar, Katrina Dugginns, Andrew Ashford and Sanjeev Rana. Kay Odysseos was also present representing 'The West Essex Clininal Commissioning Group' which is responsible for commissioning healthcare, on our behalf, across whole of West Essex. 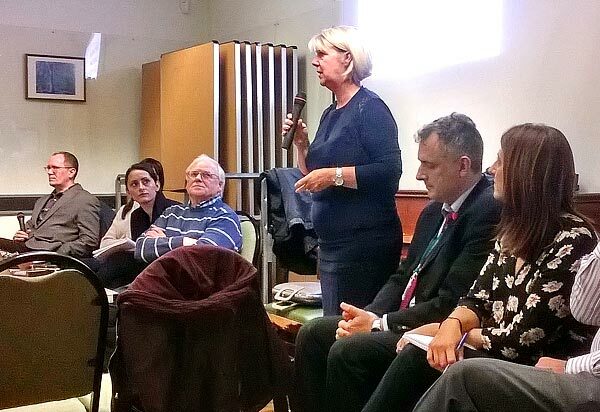 They outlined the increased workload, lack of funding and staff retention problems that all GP practices in West Essex were experiencing and the need for changes in the way they work to enable them to deal with this. It would include working more closely with local pharmacists. She said it is no longer possible to continue as in the past and new initiatives were being tried or are already ongoing, including weekend openings of certain GP Surgeries. Despite the frustration that many villagers have experienced with regard to the present village healthcare system the following Q & A session went very well. Many questioners were 'firm and clear' about problems with the Limes Practice, but all were polite, many praising the practice for what it does well whilst pointing out the issues they are experiencing. The main ones were with the appointments system and unannounced closures to the Theydon Bois Surgery. The answers were that a new telephone system is being installed and it is hoped that the new weekend openings of specific surgeries will ease the ability to obtain an appointment during the rest of the week. A new GP has now been employed by the practice and she is expected to spend quite a bit of her time at the Theydon Surgery. Parish Council Chairman John Philip wound up the meeting shortly after 9.30 pm with a suggestion to the Limes team that another open meeting would be welcome in a few months time to consider how the new initiatives were working out. As there was to be a lack of an official police presence due to cutbacks, as in Epping, the Flags and Standards were this year positioned within the churchyard rather than along the roadside as usual. 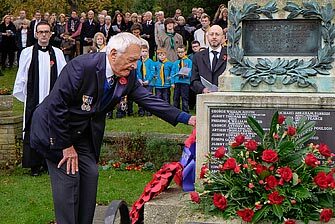 Villagers still turned out in force for this this annual Service of Remembrance at our War Memorial and our PcSO's turned up in their own time to ensure that the usual parade from the Baptist Church to the War Memorial took place safely. Unfortunately the traffic could not be halted during the Two Minutes Silence and this caused some distraction from this time of reflection, especially as there was a noisy broken drain cover in the road in front of the churchyard. The wreath laying by veterans and village and role call of names of those who lost their lives was still a moving experience and this was followed with the service inside St. Mary's Church. 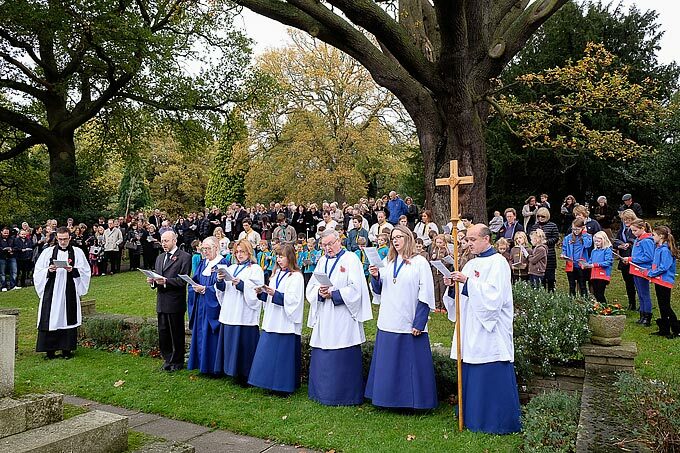 We have a full set of photos of the Remembrance Service here. As we commemorate Armistice Day, North Essex Partnership University NHS Foundation Trust (NEP) is raising awareness of its specialist services for Veterans. The Veterans First service, run by NEP has been running monthly social group meetings for veterans of all ages for the past three years. Any Veteran from any part of Essex can attend for free and there is no need to book. The meetings are informal and an excellent way to catch up with fellow Veterans, find out about various support groups and get advice on health and social issues. Those who attend will get the chance to meet with representatives from Veterans First, Combat Stress, Royal British Legion and many more who can offer support and guidance if needed. The meeting dates, times and venues are listed below. 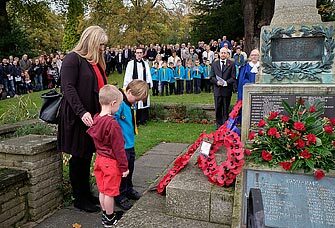 In preparation for Sunday's Service of Remembrance Dad's and their Kids (from young to adult) together with our Vicar Rev. Stephen Walker and Curate Rev. 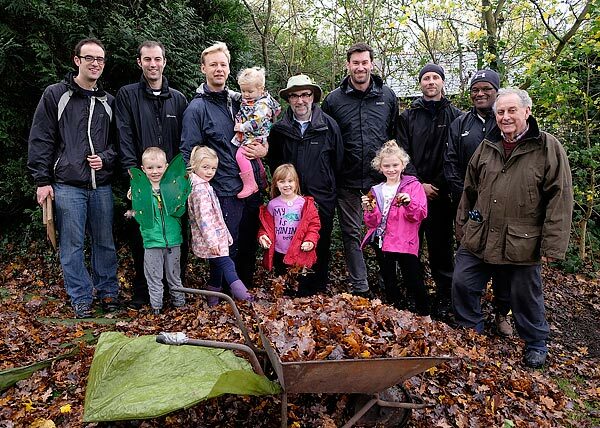 John Fry met in St. Mary's Churchyard to do some leaf clearing and general tidying up. They were rewarded for the efforts with Sausages and tea or coffee. There will be a local Community Meeting at Stapleford Abbotts Village Hall on Tue 10th November'15 at 19.30. Stapleford Abbotts Road,Stapleford Abbotts. This meeting will cover Epping, North Weald , Theydon Bois, Abridge,Stapleford Abbotts and surrounding villages. The meeting covers local priority and local issues. Meeting is open to all members of the public and will be chaired by Essex Police. It’s beginning to look a lot like Christmas at St Clare Hospice as the fundraising team prepare for the charity’s Festive Fun Run. 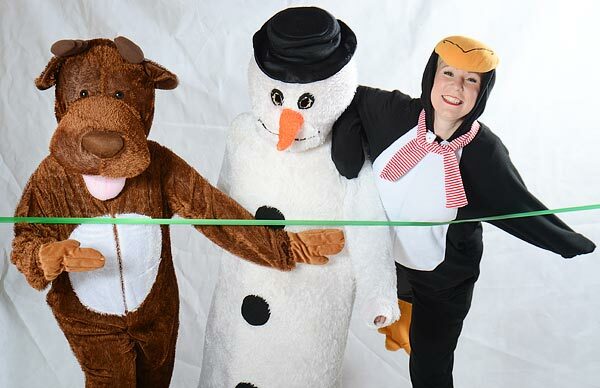 The yuletide event promises to be a ho, ho, ho lot of fun as the Hastingwood-based Hospice invites its supporters to celebrate the start of the festive season with them by signing up for the family-friendly event being held in Harlow on Sunday, December 13 at 9am. The 5km route will start and finish at The Water Gardens where there will be festive food and drink as well as Christmassy activities for all ages. 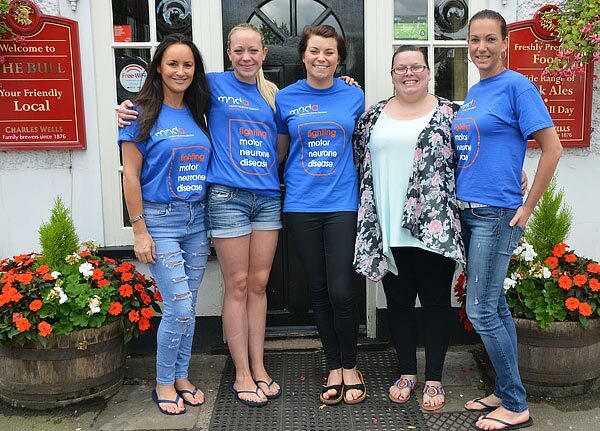 St Clare fundraiser Heather Cameron said: “Our Festive Fun Run promises to be a great way to kick off the countdown to Crimbo – and even earn yourself an extra mince pie. Registration costs £7.50 for adults and £2.50 for children and participants are asked to pledge to raise a minimum of £45 in sponsorship, enough to cover the cost of providing Christmas dinner to a family staying at the Hospice over the festive period. Visit http://stclarehospice.org.uk/event/st-clare-festive-fun-run/ for more information. Runners can also register on the day from 8.15am. The route is suitable for wheelchairs and pushchairs, and dogs are welcome. The Buxton Trust has won a trophy at the Essex Playing Fields Association 'Best Kept Playing Fields' competition. It is "for exceptional work carried out during the year", ie the new changing rooms. 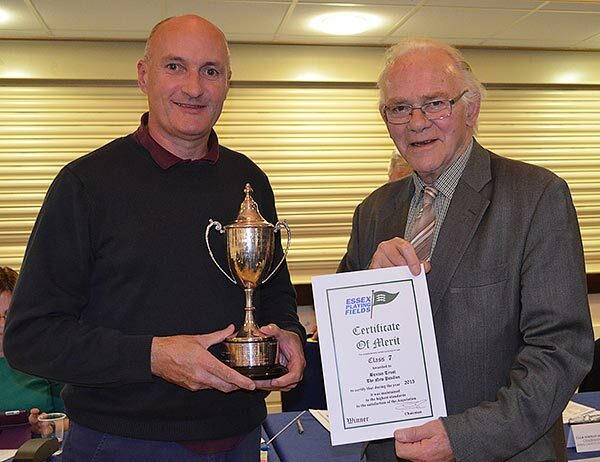 Buxton Trust Chairman, Richard Crone collected the trophy from Lord Petre at the recent EPFA AGM. Congratulations to all involved in the project. Essex County Council (ECC) have recently launched funding for residents, landowners, and organisations such as parish councils etc, who are looking to address issues relating to flooding. There are more details on how to apply for grants of up to £5,000 for residents on this EFDC web page. The total amount of money available for grants to residents is £100,000 so early application is advised. Autumn is the deer ‘rutting season’ and drivers should take particular care when driving on the roads through Epping Forest at this time. As the weather turns colder the fallow deer enter into a breeding cycle called ‘the rut’ and this can last for several weeks, depending on the weather. During this time, the bucks seem to be less aware of the dangers around them such as cars on the roads. 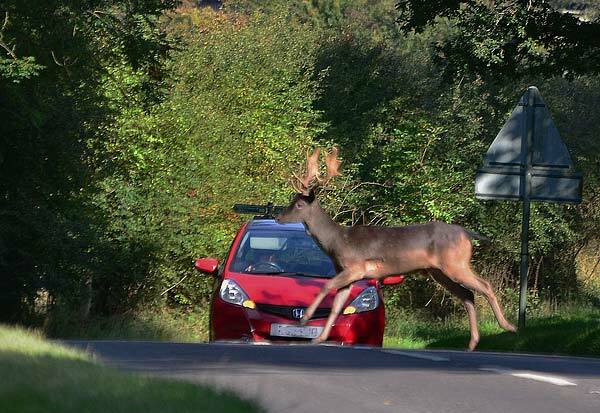 As a result, there are sadly increased road vehicle collisions involving deer. Visitors to the Forest are also asked to keep disturbance of the deer to a minimum during the rut and to keep dogs under very close control at this time. This meeting at 8.00pm on Thursday 12th of November at the Village Hall will feature a presentation about how the Limes Health Practice is run and there will be an opportunity for villagers to ask questions about issues with the Health Practice. 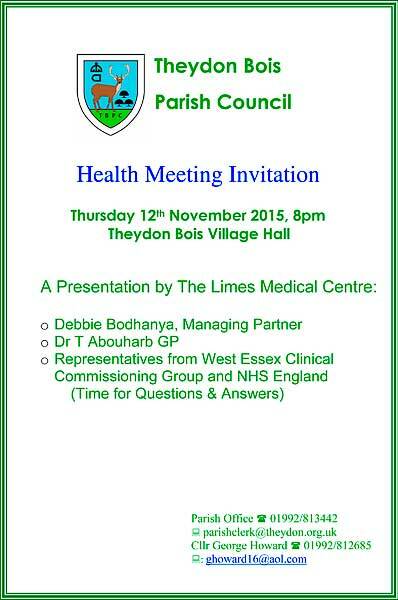 Also in attendance will be representatives from the West Essex Clinical Commissioning Group and NHS England. For further details contact either Cllr. George Howard 01992 812685 or the Parish Clerk 01992 813442. 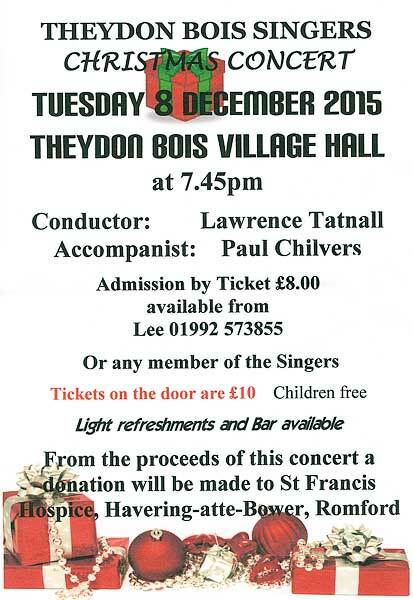 This should be a fabulous afternoon filled with repertoire from various genres and eras. Performed by children from 4-19yrs. Some performers are stepping out solo or in duets and others are performing collectively. Song choices are chosen with their teacher, Catherine Sheehy in either a private lesson at her home in Theydon or during the class setting at Theydon Bois Village Hall. There are some new singers this year, along with regulars from previous years. Many students are sitting the (optional) London College of Music exams. 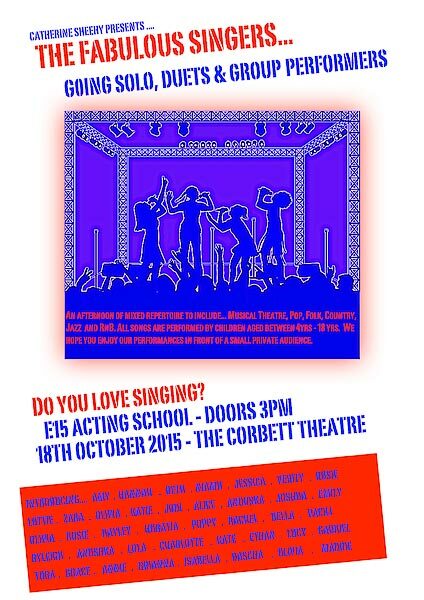 The show starts on 18th October at 3pm - 5.45pm and tickets are £10. The show will be professionally filmed this year with the assistance of E15 film crew. 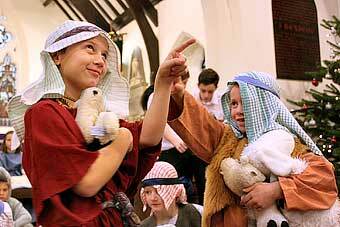 The performance takes place at the E15 Acting School, The Corbett Theatre, Rectory Lane, Loughton IG10 3RY. 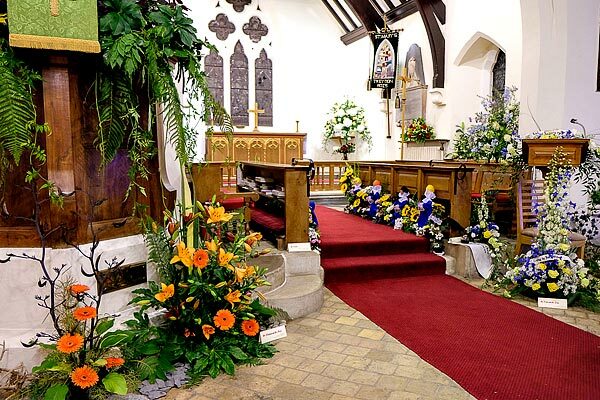 Luckily the rain did little to deter visitors from both near and far attending over the last Bank Holiday weekend when St Mary's Church was decorated with floral arrangements for their 2015 three-day flower festival. 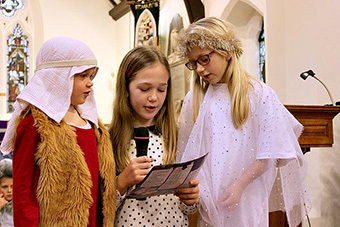 The theme was 'Saints Alive', with arrangements on the theme of Saints. In the church vestry there were further exhibitions including one on the theme of 'Saints and Roads', depicting Early Theydon Bois, put together by Theydon Bois and District Rural Preservation Society. For many years Theydon Bois residents were fortunate to have Caroline Law as their Neighbourhood Watch Co-ordinator. She carried out this role with skill and professionalism and developed a close and effective relationship with the local Community Police Team. 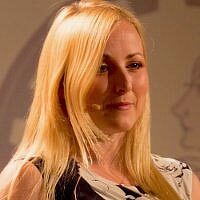 However about a year ago Caroline felt the time was right to take a step back and let someone else take over these duties. At the time we circulated an appeal for someone to step up and replace her but so far no one has responded. This is a rewarding job and our modern electric communication systems mean there would be very little demand on the new co-ordinator’s time. If you would like to be of service to your community and feel this is a role you would enjoy please make contact using the details below. The recent economic downturn has forced the authorities cut costs in all our public services including our Police Force. This has made organisations such as Neighbourhood Watch all the more important. Chair. Epping Forest District Neighbourhood Watch. At its AGM in July 2015 the Village Design Statement Association agreed to remain in existence so as to be of assistance to our Parish Council in the preparation of a Neighbourhood Plan for the Parish of Theydon Bois that will become a supplementary planning document to the EFDC New Local Plan. In the interim it was agreed to update the Village Design Statement of 2012 with a brief addendum. This has now been added as a pdf download from the VDS pages on this site. It has been bought to our attention that a telephone scam is happening across Essex, with males claiming to represent the Min1sty of Justice. They claim that victims are entitled to a large amount of money, and to receive this they are to purchase UKASH vouchers from a designated newsagent nearby. They then send someone round to collect the vouchers, in exchange for the money they are entitled to. World’s Biggest Coffee Morning - On September 25th the ladies of the Women’s Meeting are organising one of the “World’s Biggest Coffee Mornings” in aid of Macmillan Nurses, at The Baptist Church, from 10.30 am until 12 noon. Everyone welcome. I decided on raising funds for this charity as my granddad passed away last year from the disease. In the beginning I had a lot of encouragement instantly from the customers and staff members and they all helped me with ideas for the day/evening. The event itself started at 6pm on 18th July and was a huge, huge success. We hired a DJ to play from 6-11.30 and the pub was filled with people. We had already been holding a charity meat raffle every Sunday which raised around £250 alone. We also filled a glass jar with sweets and customers had to guess how many were in the jar and this had raised around £100. On the night we managed to raise a further £1302 – so we had a total of £1652. We also held a general knowledge quiz which was £1.00 per person about 15-20 groups took part in this and the prize was a bottle of champagne. Vodka jellies were available on the bar at £2.00 per shot which Sally kindly made for the event. 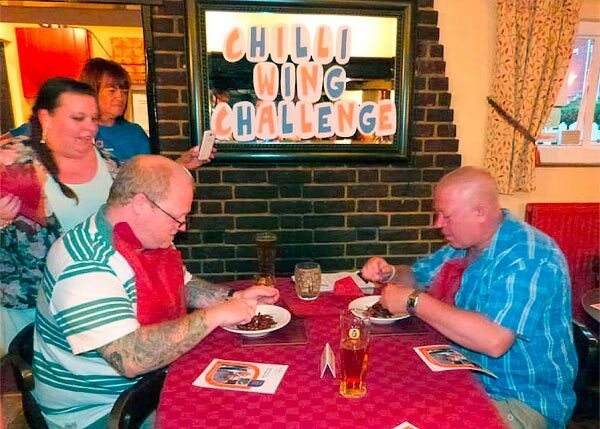 A chilli wing challenge wasn't’t as successful as I had hoped, but still had a few participants, and unfortunately one of was quite ill after. Participants had all signed disclaimers beforehand. The wings were £4.00 for 4 wings and the chilli’s used were Naga Viper Chilli’s. Joel our chef made a bbq based sauce for the wings, deep fried them and dipped them in sauce. The man on the left in the above photo above was the only one who said they weren’t hot enough! There was also a separate menu available for the evening with £1.00 out of every meal going to charity. This consisted of smaller than usual meals at cheaper prices. The costs 0f £279 came out of the charity money, so in total we raised £1977.80 with a total of £1698.80 being donated to Motor Neurone Disease. Sally kindly donated the vodka for the jelly shots and the food came out of the business. We are also waiting on a donation from the brewery through Eagle Aid. Overall the event was a fantastic turnout and I am overwhelmed with the support and encouragement from family, friends, customers and staff. It goes to show how much of a big heart The Bull and its customers really have! 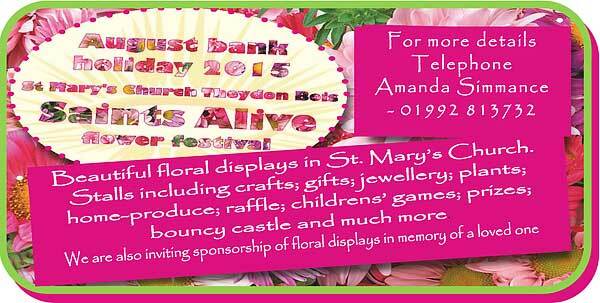 Our Flower Festivals are always special occasions and this year we are focusing on the special theme of Saints Alive. In this Flower Festival we are telling some of the great stories of our Christian forebears in flowers. Our prayer is that the stories of the Saints of the past will come alive and that visitors will find inspiration through their lives, interpreted in flowers, pointing to the Christian belief that through the power of the Holy Spirit we in our generation can be Saints Alive today. Earlier this year, the Mission Committee distributed “Bag For Lives”, with the following message attached: “I am your St Mary’s Church BAG FOR LIVES. Please fill me with good things to save lives – food, clothing, gifts of hope – THANK YOU!”. 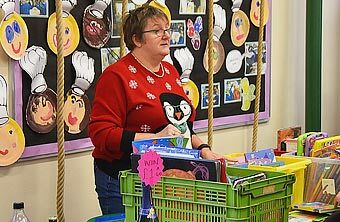 The idea is that when doing your supermarket shopping you could add something extra to your trolley to go into the bag, along with any knitted hats or gloves, warm clothing and bedding and small toys/games. You are invited to bring your Bag For Lives, filled with items collected during the year, to the 10.30am service on Mission Sunday 20th September. If you don’t have a bag, you are still welcome to bring items along. At the service we will also have a speaker from The Box, Tom Dolan. Please fill your bags with items from these lists, however much or little you are able. Each gift will make a difference. Tinned fruit, rice pudding, custard etc. Tea, coffee, sugar, dried milk, cereals, porridge oats, rice, pasta, biscuits etc. A SPECIAL PLEA – each shoebox that is sent to a child overseas costs an additional £3 to transport. If you are able to, please make a donation toward these costs in your Bag For Lives. Cheques should be made payable to Samaritan’s Purse. Little Cherubs - Baby and Toddler Group - Starting Tuesday 15th September from 1.30pm meeting in the rear hall at the Baptist Church. Babies and toddlers with parents/ grandparents or carers welcome to come and enjoy a wide range of play equipment and toys. Craft activities and musical activities take place most weeks. You are warmly invited to the Harvest Soup Lunch on Tuesday 29th September from 12 noon in the Church Hall. On offer a choice of tasty home-made soups, fresh roll and butter, delicious home-baked desserts with cream, and tea, coffee or a soft drink to finish, all for just £5 per person, £1.50 for children. There is a bring and buy stall and plenty of fun and fellowship. Proceeds from these lunches are donated to charities and organisations supported by St Mary’s at home and overseas. Please come along if you can, and bring a friend or neighbour. We look forward to seeing you. 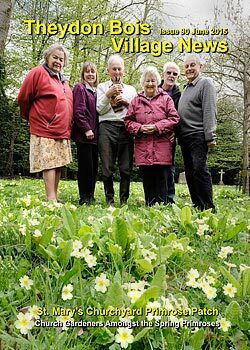 Theydon Newsdesk is very pleased when villagers tell us how much they enjoy receiving their copies of Village News that are delivered through their letterboxes four times a year. Both Village News and the Village Website are run totally by volunteers and all our costs are met by the generosity of our sponsors, we do not make a profit or run at any cost to village tax payers. 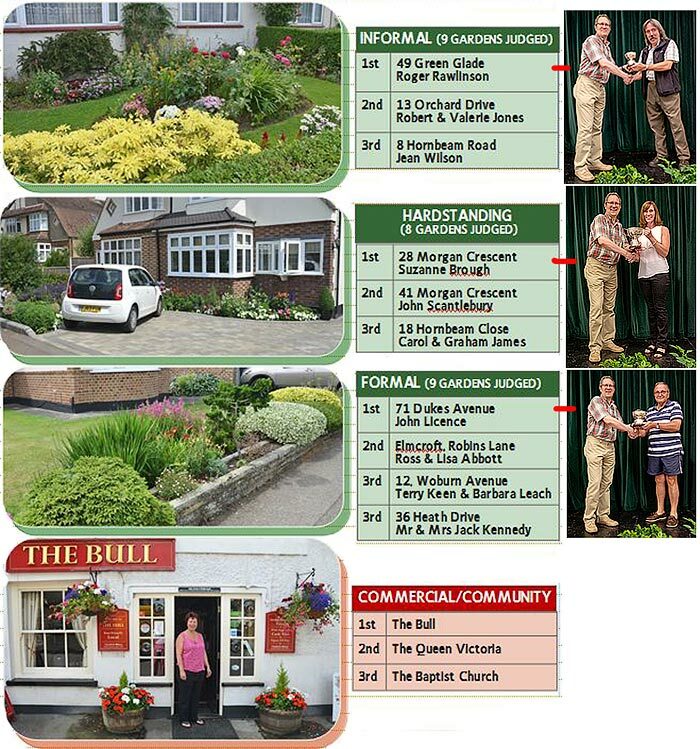 We are in particularly very grateful to all our Village News distributors who make sure your household gets a copy of the magazine as soon as possible after we get them back from our printers. Between them they deliver over 1,800 copies to every home in the village. Unfortunately some of our distributors have now moved from Theydon, and we sadly also have some who are ill and so unable to take on their usual delivery round at present. So are you able to help us ensure that everyone gets their copy of the magazine as usual? We only deliver four times a year and most distributors only take on a delivery to one village road, or a part road for the longer ones. We delivery the magazines to our distributors and we also try to allocate roads for distribution as close to the distributor as possible. So it will probably take less than an hour of your time. 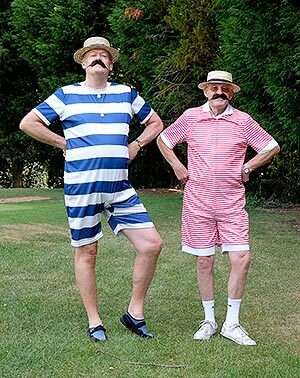 More and more Theydon residents are discovering the therapeutic effects of a weekly dose of top quality traditional jazz in the convivial, on-your-doorstep surroundings of the Theydon Bois Golf Club. The programme for the next quarter includes most of our regular favourite bands, 14 of the best in the country. Pictured above is the Melvin Beddow Big Band appearing on 12th October. Do come along to one of our Monday evenings; you can eat, drink, even try out the dance floor . . . and enjoy great jazz. with Theydon Bois district councillor John Philip. Epping Forest MP Eleanor Laing has today given her support to a new initiative launched by the Campaign to Protect Rural England to ‘Save the Green Belt’. The campaign follows recently released data that shows that 226,000 houses are currently planned for development on Green Belt land. 2015 marks the 60th anniversary of the Green Belt. Since 1955, when it first became national planning policy, the Green Belt has been hugely successful in protecting the countryside and aiding the regeneration of towns and cities across England. The Epping Forest district is more than 90 per cent Green Belt and benefits from historic protections from the City of London as well as the national planning framework. The present national Green Belt policy - introduced under this and the last Government - is one of the most protectionist ever and the Conservative Manifesto included an explicit promise to uphold the Green Belt's protection. Mrs Laing said: “We need new houses and we must support the expansion of businesses but if we lose some of our precious Green Belt we lose it forever. Mrs Laing added: “There are, of course, some exceptional circumstances that mean small amounts of Green Belt have to be sacrificed, for example when brownfield land would otherwise go to waste, but those must be exceptions, not the norm. “Epping Forest District Council is very good at protecting the Green Belt and I commend the council for that. “The national legislation is in place to protect our Green Belt. After more than a year of fruitless correspondence and discussions, Transport for London (TfL) has finally agreed, in a legally binding document at the High Court of Justice, not to develop a commuter car park on Green Belt land to the east of Theydon Bois station without first gaining full planning permission. This was as a result of the application by TBAG's Chairman, Dr. John Warren, to the High Court for a Judicial Review against Epping Forest District Council (EFDC) with TfL being cited as the Interested Party. Both EFDC and TfL had asserted that the car park could be constructed under Permitted Development rights based on old Victorian railway Acts but this would not have allowed residents, the Parish Council or other third parties to make any comments which took into account important National and Local Planning Policies relating to the Green Belt, or other issues such as road safety. TBAG, with advice from its barrister, remains adamant that these Permitted Development rights do not apply in this case. Following the application for a Judicial Review, EFDC approached TBAG's Chairman offering an out of court settlement that, if the Judicial Review was withdrawn, TfL would be required to submit a full planning application if they wished to pursue the development of a commuter car park. This agreement has now been formally sealed in a Consent Order at the High Court of Justice, Queen's Bench Division, Planning Court. work that is often substandard, overpriced and unnecessary. They are urging all residents to keep an eye on elderly or vulnerable neighbours and call the Citizens Advice Consumer Helpline on 03454 040506, who handle calls for Trading Standards, to log any concerns so that we can ensure that residents do not get ripped off. ▪ If you need work carried out get at least three written quotations and ask family, friends and or neighbours about traders they have used. During the summer holidays you may visit a Heritage site, a museum, visit a park or simply go for a walk within your own neighbourhood. Essex has many historically sites and assets locally for everyone to enjoy. 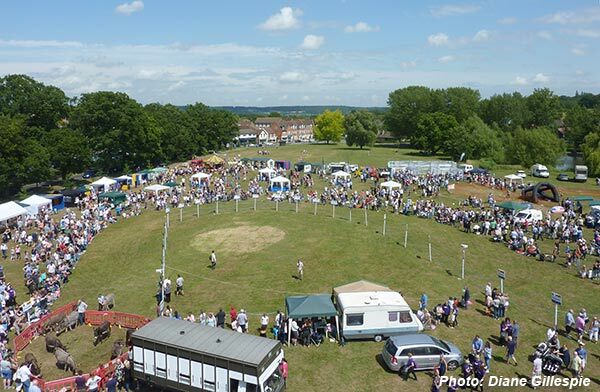 Essex Police launched Heritage Watch this year to help protect these sites and assets with the help of the local communities. If you are interested in joining Heritage Watch contact Essex Police on 101 and ask for your local Essex Watch Liaison Officer who will provide you with full details. To report incidents of anti-social behaviour against a heritage asset or a theft call Essex Police on 101 or 999 if judged urgent. If you want to remain anonymous, report the incidents to Crimestoppers on 0800 555 111. 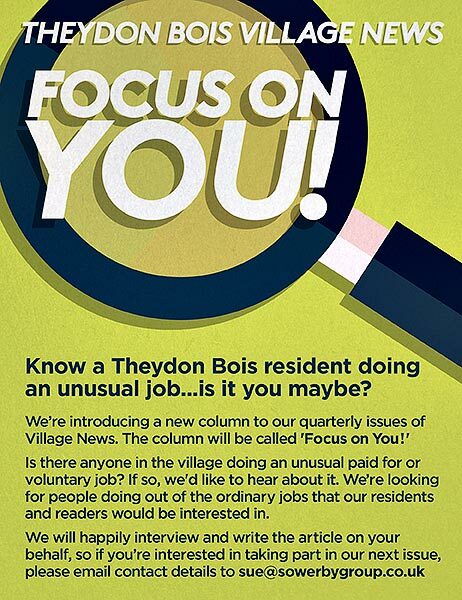 Theydon Newsdesk wants to run this new column in Village News as we know that there are many villagers in Theydon that have some very unusual jobs that they are either paid for or that they do on a voluntary basis. We are sure our readers would be facinated by your story. So why not tell us about it? We can interview you and perhaps take some photos. Please contact Sue Sowerby by e-mail to learn more. Theydon Bois –on-Sea for the Lady Captain’s Day. 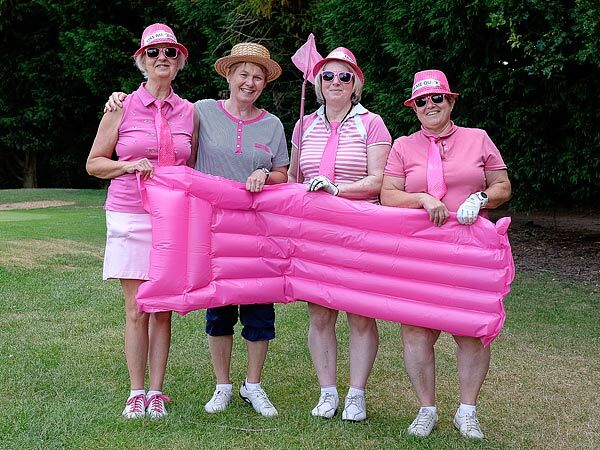 42 Lady Golfers – appropriately attired in seaside costumes - played the course and were treated to snacks and Pimms at the “beach Hut” on the 11th green – served by the Lady Captain, Linda Ames and helpers in Victorian Bathing Dress! Bunkers were decorated with sand- castles and sticks of rock were awarded to those who went in them. 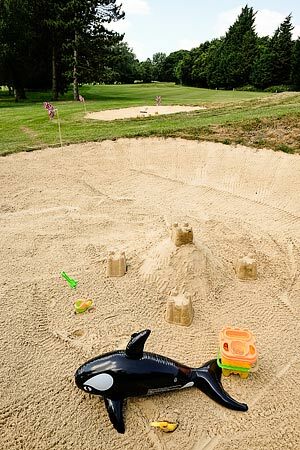 A very good “Day at the Seaside with a little Golf thrown in” was had by all! 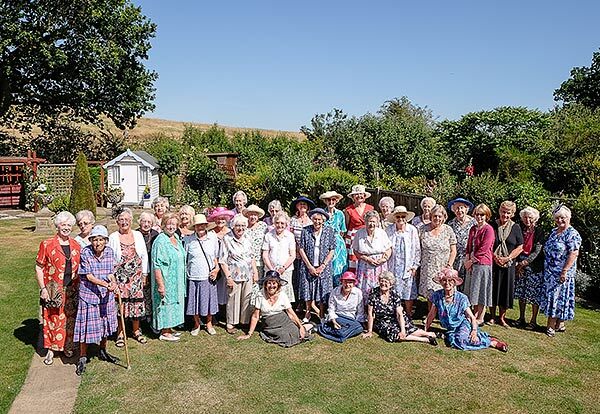 The WI is celebrating 100 years this year and our local WI in Theydon Bois decided to have their own celebration in the form of a Garden Party last Friday the 10th July. 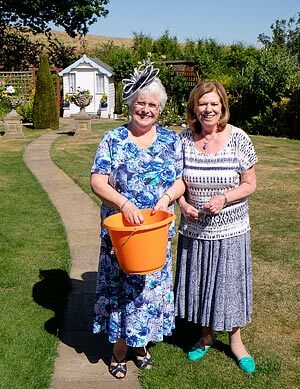 WI member Mrs Carole Browning and her husband were kind enough to open their beautiful garden for this event. The weather was glorious and over 40 members enjoyed tea and home-made cakes in the sunshine. As well as the tea and cakes there was a raffle with many prizes. The ladies decided to make this celebration special by donning their best dresses and of course, the obligatory hat. Most of the ladies that attended are pictured above in a group photo in the garden. 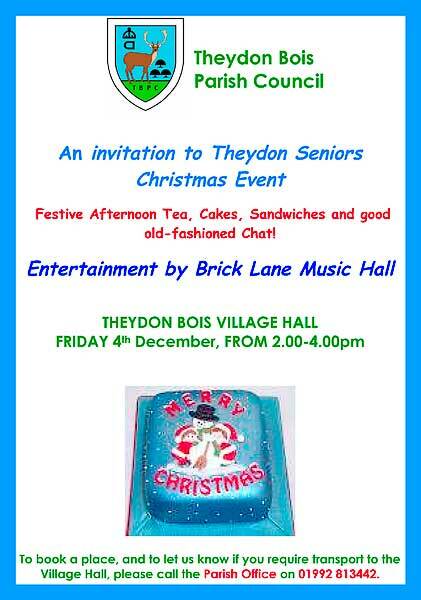 If you think you would like to join the Theydon Bois WI, please come along to the Village Hall on the third Wednesday of the month at 2.00pm. There is no meeting in August. We are sure you will enjoy it and you will also make a number of new friends. You will certainly get get a warm welcome. We hold many events during the year including Speakers on various subjects, a Sherry/Coffee morning (very popular), a Fish Chicken and Chip Lunch, a new Year Lunch, which includes wine and the lunch is cooked for us by a professional cook. The are also often outings to the theater. 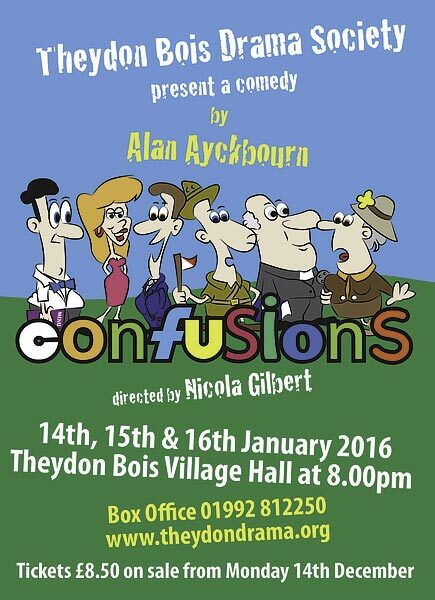 Some more information about Theydon WI and our Speakers Program for 2015 is on the Club Details Page or phone Doreen on 01992 812645 or Jackie on 01375 508915 who will be happy to help. 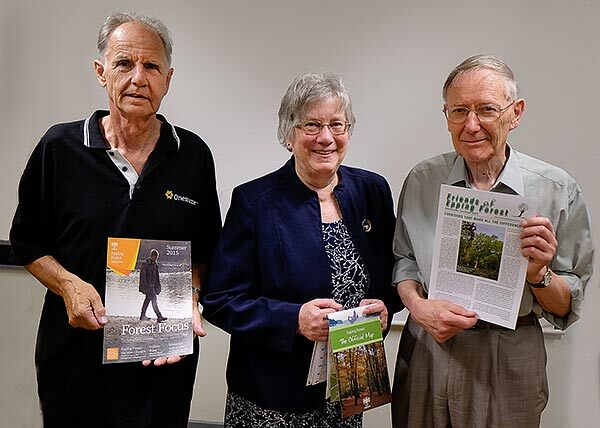 The guest speaker at Theydon Bois & District Rural Preservation Society's AGM last Friday the 10th July was Judy Adams, Chairman of the Friends of Epping Forest. Judy gave an informative talk on Conserving Epping Epping for the Future to an audience of nearly 50 members and guests. In the interval those present then enjoyed refreshments provided the Society and this break was followed by the AGM. Following the the sad death of the Society's President, Bob Day earlier in the year the Society welcomed Michael Chapman as its new president. Michael is a Notary Public and Solicitor who has lived all his life either in the Forest parishes of Theydon Bois or Epping. He was educated at Leyton County High and then articled to solicitors in Loughton. Michael is currently Deputy Lieutenant of Essex and a former Chairman and previously held the post of Vice President of the Theydon Bois Rural Preservation Society. 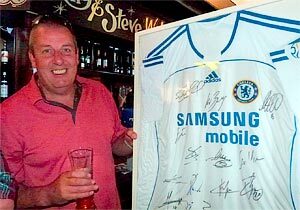 Michael also serves as Chairman of St Clare Hospice and Associate of the Epping Forest Field Centre. Other officers and committee members were re-elected into the same posts for another year, but the Society still has four vacancies on its committee. The committee only meets six times (plus the AGM) each year and would welcome any villagers that could spare a little of their time. With EFDC still working on a new Local Plan and recent developments putting further pressure on our Green Belt the Society would like to see villagers having as much input into how our future is determined as possible. 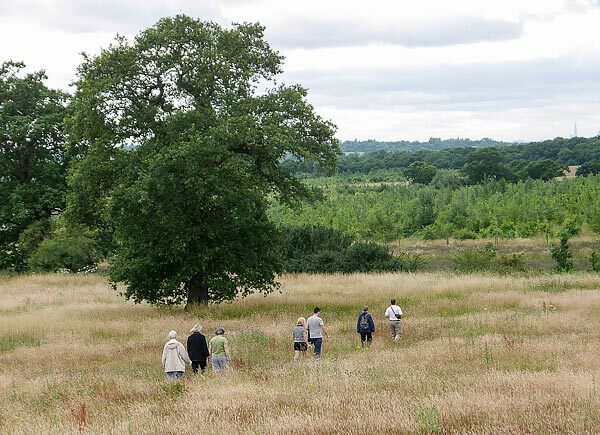 On Sunday 12th July Robert Levene, TB&DRPS committee member and Theydon Bois Tree Warden led a walk via the Sheep and Goat milking farm to the Theydon Wood to view the 'Open Air Landscape Artwork' and the progress with the wood. The Society's next walk is on Sunday 27th September and is titled "Towards Blunts Farm/Theydon Garnon way". 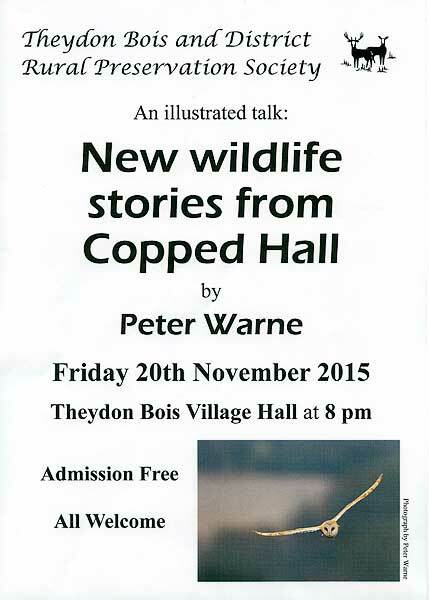 The next talk on Friday 20th November is by Peter Warne. Peter continues to map the wildlife at Copped Hall on behalf of the Trust. There are new species to report and previously mentioned species with new stories. A new project is seeking out the moth population which involves setting up night light traps and early starts to see what has been caught. The weather was almost an exact repeat of last year with rain just before the 12 noon start delaying peoples early arrival, but then the sun came out and in the end thousands of people attended to enjoy the races and the many sideshows. The day also clashed with the Epping Town Show, but this did not seem to reduce attendance and some people managed to visit both of these local events. 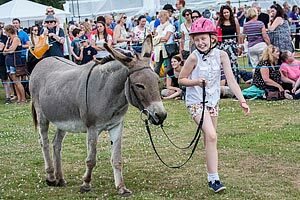 As well as the seven Donkey Races races sponsored by local businesses and individuals that took place throughout the afternoon there was also a fun dog show that challenged owners and their for-legged friends. 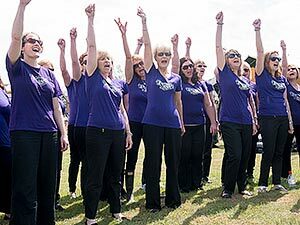 Loughton Popchoir entertained the the large audience with some spirited singing. 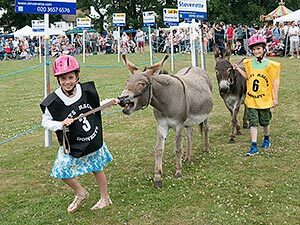 No one managed to win the £100 offered if you rode the 'prepared bike' over a short distance, but everyone did have a good time and are looking forward to the 29th Donkey Derby next year. 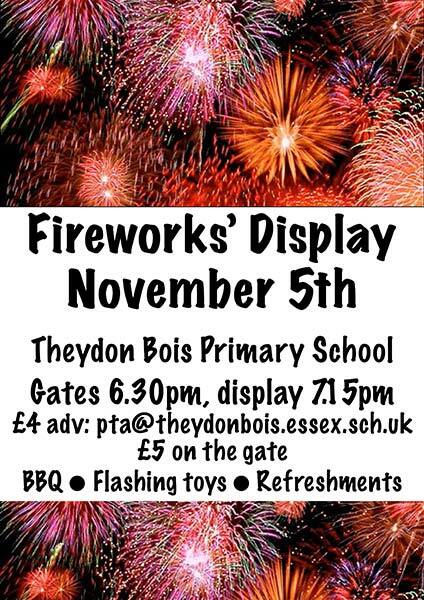 The amount raised by the event is still being calculated, but as usual all the proceeds will go to the Theydon Bois Scout and Guide Groups and various other deserving local charities. 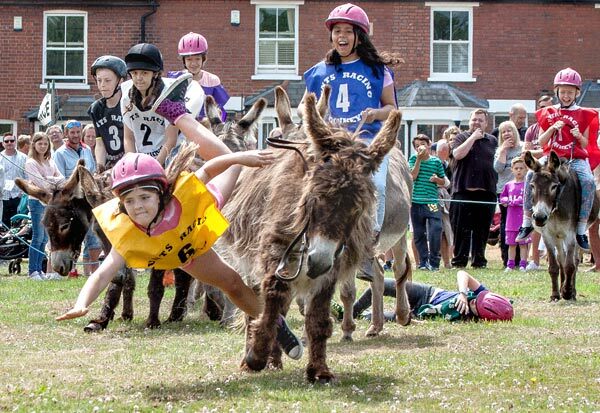 Many more photos of the this years Donkey Derby can be found here or on our Photos Page. Essex Police are warning villagers to be particularly cautious at the moment following a recent spate of burglaries in Theydon. Break ins took place in Hornbeam Road and Hornbeam Close between the 19th & 23rd June and yesterday there was a another burglary in Coppice Row. If you saw anything suspicious in those roads around those days please contact Essex Police on the 101 telephone number. If you see any suspicious behavior around the village again please ring the above number so that hopefully the police can respond quickly. 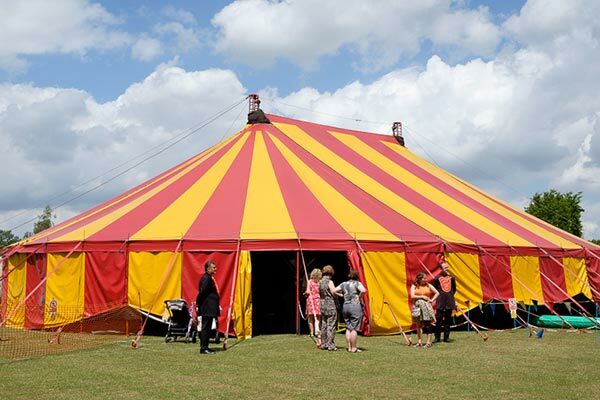 THEYDON Bois Primary School had a real treat in June when the circus rolled into its grounds. Happy's Circus rumbled in with their big top and set up on the playing field. The school children were invited to have a look around as the circus folk set up on the Friday ready for the big show on the Saturday 27th. 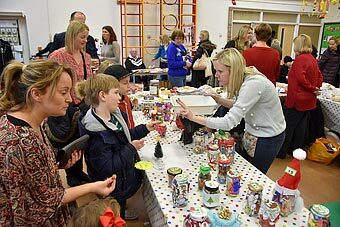 The PTA opened the event at 12.30pm with a barbecue, refreshments, a bar and stalls before the main event began at 2pm. And every seat - all 600 of them - was sold out by the time the show started. 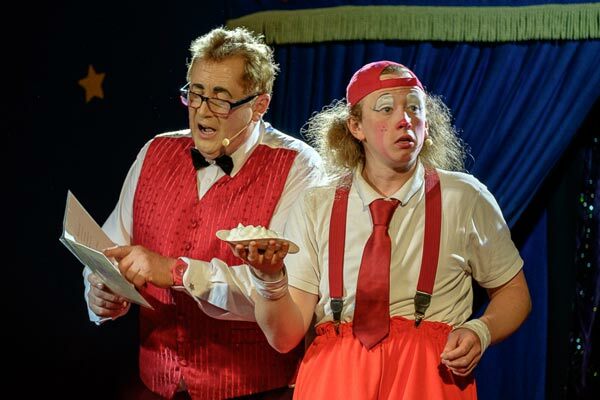 The children were enthralled by the clowns, Mr Happy and Pip as they launched into their routine. Even the adults were soon laughing at their fun, high jinks and magic. Also performing was sword balancer Micaela Cardona who managed to climb a ladder whilst holding a flaming candlabra, balanced on a dagger and sword, in her teeth! Acrobat Serhiy Valkiv wowed the crowds on the high straps as he 'flew' in dressed as Spider Man. He later performed another routine, balancing on balls and rolling cylinders. There was also another aerial acrobat and a juggler who managed to perform his routine throwing five tennis rackets. The event was wrapped up by clowns Pip and Mr Happy who had the children screaming with delight as they were sprayed with water from a fire extinguisher as part of the finishing act. On a superbly hot day it was a brilliant ending. 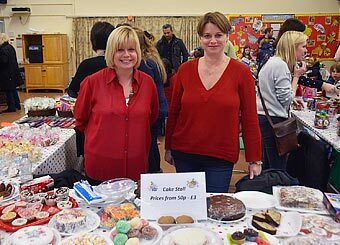 For the PTA there was another happy ending as the event managed to raise approximately £3800 - with a possible extra £1000 in match funding - for their coffers. PTA chair Nik O'Flynn said: "It was a great event and I hope one that everyone will remember for a long time. We had a fantastic turnout, great weather and a lot of support from helpers and circus-goers who dug deep for the refreshments and the stalls." 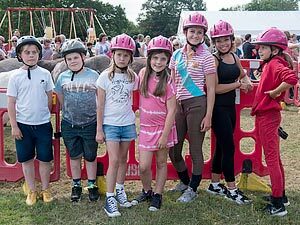 There is a full set of photos of the Circus and surrounding events on the 27th June Here or see our Photos Page. Visit Epping Forest on Sunday 12 July for a jam-packed, fun-filled day out for all the family, including the dog! 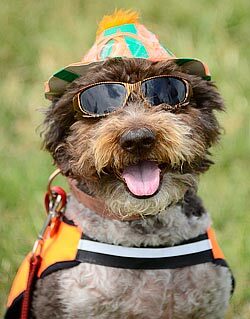 Paws at The View will include fun activities for dogs and their owners, including have-a-go agility, displays, stalls, tombola and a companion dog show. 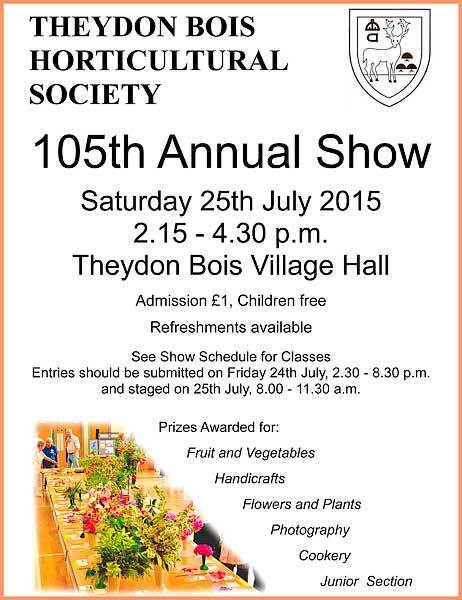 Free entry, with £1 entry to the dog show. The City of London Festival promises to be a great afternoon of free live music and activities. If that isn’t enough to entice you, you can also take in ‘Tudor Stuff’ at Queen Elizabeth’s Hunting Lodge between 2pm and 4pm. Costumed guides will bring The Hunting Lodge to life and there will be Tudor art and craft activities on offer (£1 for an activity). In addition you can take the opportunity to catch the opening of the Summer Art Show 2015 at The View, which features a collection of artwork submitted by local artists inspired by Epping Forest. All events are taking place at The View and Queen Elizabeth’s Hunting Lodge on Rangers Road (E4 7QH), Chingford between 11am-4pm. For further information telephone 020 7332 1991 or visit www.cityoflondon.gov.uk/eppingforest. 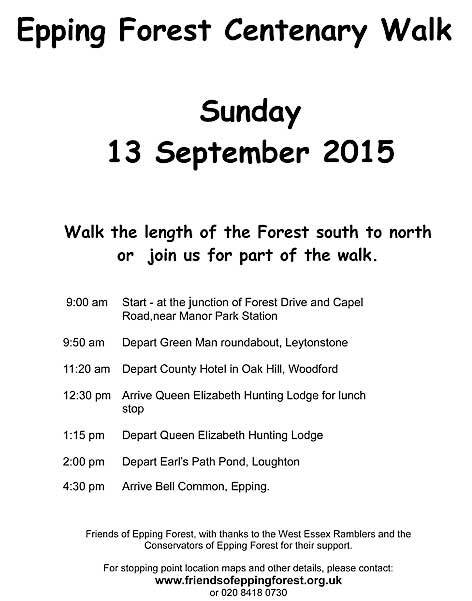 Follow Epping Forest on twitter @COLEppingForest. Epping Forest is developing a new management plan, so the City is asking for your help to find out what you value about the Forest and which issues are most important to you. In the largest consultation the City has ever undertaken, they are keen to hear your views on the management of the Forest, from litter to events and activities to preserving the 'natural aspect' - and everything in between! The consultation is internet based so register on our online system now to take part. Once you log in, you will need to go to the Epping Forest Management Plan Consultation. This is a long document, but if you register you can dip in and out of the response and you do not need to answer every question. This Consultation is a major issue for the residents of Theydon Bois and we would urge you to have a look. 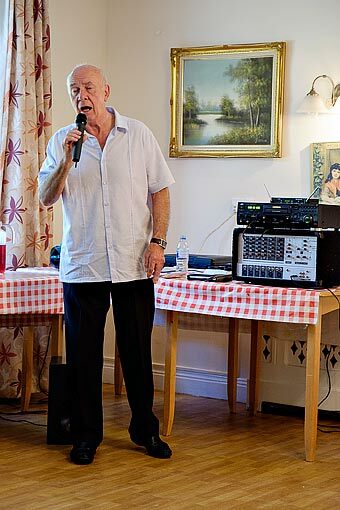 Frank Foster House held an Open Day last Thursday 26th June with food and entertainment for residents and guests. That day was chosen as it was also also home resident Lily Evans 101st Birthday. 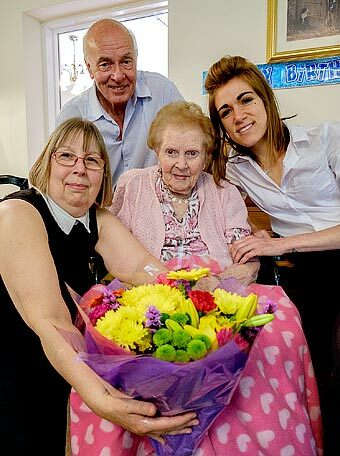 She was presented with flowers and a cake with candles for her to blow out. Entertainer Patrick led those present in a couple of choruses of 'Happy Birthday to Lily'.